After you beat the main story, you'll reach the Division 2 endgame. You may think there's not as much to do after you reach level 30, but the fact of the matter is that you've barely even scratched the surface of the game by that point. The Division 2 endgame has so much more content for you to feast on, from invaded missions and raids to level four control points and exotic weapons. You'll need to prepare yourself though, because The Division 2 definitely doesn't get any easier. The Black Tusk faction invade and they've brought a bunch of weaponised robot dogs with them - scary stuff. Here's everything you need to know about the Division 2 endgame. The Division 2 level cap is set at Level 30. If you're doing everything possible to work your way through the game's main missions, you should hit that by the time you've taken back full control of DC. Of course, if you're wondering how to level up fast in The Division 2, we've got you covered too. But, once you do hit Level 30, you may be wondering what exactly's changed. The map looks nearly identical, aside from the appearance of a new Stronghold to the east of the map. This, and the fact that one of the three Dark Zones suddenly has gear normalisation disabled, is basically the starter to your endgame buffet. To access the real banquet of content, make sure you've completed all three of the Strongholds - True Sons, Outlaws and Hyenas. They're long, and incredibly difficult, even as a foursome, but you'll get loads of XP and tasty loot for doing them. Oh, and unlock the entire endgame. On completing all three, you'll be teleported to World Tier 1, which is the signal you've entered Division 2 endgame territory. You'll get a cutscene, and it's then that the entire map basically resets. The Black Tusks are here, and they've taken back control of DC, meaning you've got to start from scratch. In a nutshell, Division 2 World Tiers are basically the equivalent of levels in the Division 2 endgame. But, not only do they decide on your agent's level, they also have an affect on how strong your foes will be, along with the quality of gear and crafting blueprints you'll be able to discover and use. As you'd expect, with every World Tier, the difficulty of the missions available also rises. There are currently four World Tiers available in The Division 2 endgame, but a fifth is coming later along the year-long roadmap. To progress through the World Tiers, all you need to do is complete Invaded missions, make sure your gear is at the correct level and then beat the associated Stronghold. If you're familiar with Destiny 2, you're going to find that the Division 2 Gear Score is basically its version of Power Level. Once you reach The Division 2 endgame everything you own will be assigned a Gear Score number - each gear piece, weapon and mod. These all contribute to your overall Gear Score, which is then used to measure your combat power, as well as overall progression. World Tier 1 is capped at 300 Gear Score, Tier 2 to 350, Tier 3 to 400 and the fourth to 450. 1) It's worked out from the gear you have equipped, so try to pick the kit that gets you the highest score possible. That way you'll progress through the World Tiers much faster, even if you take a slight hit on your stats. 2) Your Gear Score dictates the score for the loot that drops, but not from your current Gear Score. It's actually from the highest possible score from all your gear across your inventory and your stash. Mmmm. Delicious Loot. The best way to make sure you've got the highest possible Gear Score is through crafting. The specifics of how it all works is in our The Division 2 crafting guide, but the key difference for endgame crafting is that you'll need to upgrade your crafting bench for each new World Tier, in order to ensure your crafted gear drops at the highest Gear Score possible. Don't forget to check gear vendor shops too, as occasionally they'll have some sweet gear too. Because The Division 2 endgame is based all around Gear Score rather than your agent's level, suddenly the PvP areas become incredibly useful. Its in the Dark Zone and in Conflict that much of the highest-rated loot reside, so take some time out of the main DC area to head into either of these activities when you can. Both modes are excellent sources of money, materials and powerful gear. Although, be sure to open caches as soon as you et them, as the gear inside is locked at the level you found it. That means the stuff inside may be outdated by the time you open it. Anyone who played the original Division will remember the Legendary missions that got introduced in its second year. Well, The Division 2 endgame Invaded missions work in a similar way. On paper, they basically sound like replaying the main missions at a higher difficultly level. But, that's not entirely true. The original foes have now been replaced by the fourth faction enemies, The Black Tusks, which are seriously nasty beings that fortify missions in different ways. Plus, there are new story beats to explore and new objectives to tick off. Invaded missions are much more interesting and cleverly designed than they suggest. A fourth Stronghold will also be listed on your map, but won't unlock until a) you've beaten all three of the other Strongholds, and b) World Tier 5 drops. There are a total of 52 named bosses that will wander around Washington DC in The Division 2 endgame, compared to the now rather measly sounding 15 from the original. They've been dubbed the Deck of 52, because each of them will drop a collectible playing card when defeated. The card will be marked with one of the four factions, as if they were suits in a deck of cards. In order to get the best loot, you'll need to complete the entire deck of bosses and gain the rewards before... yes, you guessed it... they respawn. It's quite a feat to get them all, but if you're a completionist this will come like music to your ears. Then there are the bounties. These are targets that are assigned to you by an NPC called Otis Sykes, and they're a little different to the bosses in that you have around 15 minutes to get to their location and start fighting them. Once you've found them and engaged in combat, the timer thankfully stops so you've got time to take them down like any other enemy. However, if you die, you'll fail and that bounty will need to be reassigned to you. Signing up to take down a bounty from Sykes will cost you Intel though, which is a resource that you'll get just by playing the game. However, there is a way to pick up bounties for free, and that's through another NPC called The Snitch. If The Division 2 had Xur, he'd basically be The Snitch. He travels around the map, and if you find him, talk to him because he'll assign you a lucrative bounty that comes in the form of one of the Deck of 52. That means you tick off a bounty and a boss in one foul swoop. Plus, speaking to the Snitch then marks the location of Cassie Mendoza, another travelling merchant who will sell you high-level, but expensive, gear. 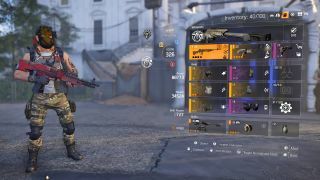 Another addition to The Division 2 endgame will come in the form of Heroic Bounties, which will arrive with World Tier 5. As you can imagine, they'll be much harder than standard endgame bounties, but will offer better rewards for taking them out. Any more details about them is scarce as yet, but we'll find out more in the coming months. Remember when all your Control Points were glorious green blobs on your map? Well, The Division 2 endgame undid all of that good work, so prepare yourself to miss all that green. Endgame changes Control Points considerably, as soon after you've taken one back, The Black Tusk will sweep back in to regain ownership. It all makes moving around DC much more complicated and stressful, but also means that every time you reclaim a Control Point, you'll get access to a fully replenished Supply Room filled with swag. They're a really great source of loot and crafting materials, and if you refill the Control Point's resources you'll get a boost of XP that will push you towards unlocking your next Field Proficiency Cache. One tip though, make sure you've unlocked all the safe houses on the map before you get to The Division 2 endgame as they'll be essential for fast travel movement. The Theater and White House are the only two places entirely unaffected by The Black Tusk, as the Campus, for example, will routinely need you to clear Black Tusk blockades before you can get back to it. Of course, there are plenty more Division 2 endgame activities to undertake too. On top of the public executions, territory controls, resource convoys, and other activities you've no doubt participated / stopped along your Division 2 journey so far, there are Elite versions to be undertaken too. These usually appear as Unknown Activities on the map, which are marked with a question mark on the map, and will reward you with extra special high-level loot. I'd recommend completing as many of these as you can, as it'll mean your XP is constantly boosted towards that next Cache, and you'll earn dropped loot, tick off project requests and more. They're much more than a minor detour. Even at this stage the amount of content available in The Division 2 endgame is staggering, but there's more to come in the near future. Of course, there's World Tier 5, but also raids, which are eight-player missions that are much harder and more unique than the Strongholds. There are more specializations on the way too - read more about The Division 2 specializations in our guide - along with more story and other updates to come over the next year.